Looking back over the past two decades, America’s workplaces have become decidedly more inclusive of lesbian, gay, bisexual, transgender and queer (LGBTQ) employees. The demand for an engaged, productive and talented workforce requires that companies attract and retain workers across the broad spectrum of diversity. Today, a company cannot afford to leave a talented worker – LGBTQ or not – out of the mix and off the table. Over and over again, companies like UPS have doubled down on their commitment to inclusion as not only the right thing to do, but as a smart business decision. 99 percent of participating companies have inclusive nondiscrimination statements on the basis of sexual orientation (92 percent in 2002). 97 percent of companies have gender identity nondiscrimination protections (5 percent in 2002). 79 percent of companies offer comprehensive healthcare coverage for medically necessary care related to gender transition for transgender workers and dependents (at the inception of the CEI, none of the participating companies offered this critical coverage). 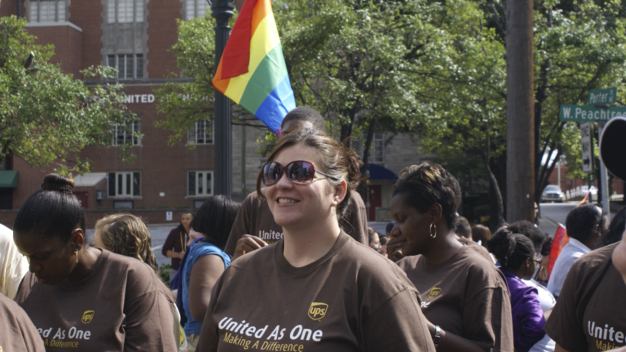 UPS is also an active member of HRC’s Global Business Coalition working to ensure its values of respect and nondiscrimination are consistent across its operations around the globe. UPS and the UPS Foundation are also generous and active supporters of HRC’s work through annual grants and sponsorship support. But as far as we have come toward LGBTQ equality and inclusion in the workplace, the journey is just beginning. The policies, practices and benefits measured in the CEI set a strong foundation for a truly inclusive workplace. However, the rubber meets the road when those policies and practices become workers’ day-to-day experiences. By that measure, we’ve seen mixed results. New research from the HRC Foundation, A Workplace Divided: Understanding the Climate for LGBTQ Workers Nationwide, found that 46 percent of LGBTQ employees remain closeted at work. More than half of LGBTQ workers report hearing jokes about lesbian or gay people at least once in a while and more than one-third (37 percent) let those jokes and other negative comments go unaddressed. The main reasons LGBTQ workers don’t report these jokes and negative comments about LGBTQ people to a supervisor or human resources? They don’t think anything will be done about it – and they don’t want to hurt their relationships with coworkers. As far as we have come, we can and must go further. Workplaces that go beyond inclusive policies to truly cultivate an inclusive climate are a win-win for employers – they mitigate the costs of the closet and capitalize on the focus and energy that comes from people bringing their full selves to work. Allies are key to this transformation. As we look ahead, we must ask ourselves how we can continue to move the needle on creating a more welcoming and inclusive work experience for everyone. At HRC, we stand ready to help you – as the company and as individuals – on this journey. Check out our resources at www.hrc.org/workplace and connect with our team at workplace@hrc.org. Together we can go far to create lasting change.